'''Fëanor Láng''' is currently a Force Disciple with affiliation to Clan [[Scholae Palatinae]], House [[Imperium]]. Once the son belonging to a surviving, noble Alderaani family; Fëanor now works alongside members of the House when needed by its Quaestor, [[Shadow Nighthunter]]. A Dark Jedi who delves in Force sorcery, the half-Sephi continues to seek his purpose in life as well as serve and assist Shadow in any way possible. Fëanor was born in 11 ABY as the illegitimate son of a human noble, Calcos Balmiren, and a Sephi servant May Láng on the world of Naboo. The Balmiren family being survivors of the destruction of Alderaan, they were now established in Theed where Calcos ran a trade operation. Not too long after Fëanor was born, Calcos had his mother forced to leave for the sake of trying to prevent public embarrassment with the child being left with him. With her baby's life threatened should she ever try to retaliate or see her son, May had no choice but to leave her boy with the cruel man. Fëanor would go on to be raised by Calcos' wife, A'liara, alongside with her daughter and son, Kara and Darion. He did not inherit any Sephi physical features from his mother but did inherit her purple eyes as well as something else that would later impact his life. Unbeknownst to Calcos, May came from a Force-sensitive bloodline. When Fëanor was seven, an incident involving his older half-sister and younger half brother led to the discovery of his strong Force-sensitivity when he stopped a ball in mid-air meant for Darion's head. With the gardener as a witness to counter Kara's lies about Fëanor attempting to hurt her, as well as Fëanor's use of the Force, Calcos would seek out a mentor for his son with the hopes of using the boy's powers to his own selfish uses one day. Life wasn't so easy for Fëanor. Kara, having taken after her father from a very young age, bullied and did what she could to get the boy in trouble. Darion for awhile was very close with the half-Sephi, but would come to distance himself from him after his older half-brother was wrongly blamed for leading him to a dangerous swamp and severely beaten for it. Calcos would brainwash Darion into being a spoiled brat like his sister and would have nothing to do with the sibling he once admired. Calcos himself treated Fëanor more like a pet. Obsessed with his son's power and future usefulness, he was often cold and would beat the boy despite his own wife's protest. He put his other children first before Fëanor, and did nothing to stop them from taking shots at the half-Sephi unless it was in public. The only other person who showed him compassion besides the estate staff was A'liara. Though she had been angry towards her husband when she found out about the affair, she had shown nothing but kindness to Fëanor, and had completely accepted him as if he was her own. She always did her best to comfort and protect him, and it was that kindness that would shape the boy into the man he would become. Many times, she risked her husband's anger to save Fëanor from beatings, but would only be met with Fëanor telling her to let it happen. Her love and compassion would pay off when her own children would fall to their father's egotistical ways as the son of a servant would continue to honor her with respect and returned compassion. There was also Mystic Lillian, a Force-sensitive that his father had hired to train him in the Force. She wasn't fond of Calcos, and pitied the cruel man's son. She spent many moments teaching and talking with Fëanor, and many times the two had fruitful discussions about Force philosophy and ideas. The young student would come to admire her abilities in Force sorcery, to which his admiration was awarded studies on such path. He was a fast and determined learner and would do all he could to impress his mentor as well as pursue his utmost potential. Fëanor, despite how he was treated, normally treated everyone with respect. Normally quiet and to himself, he hated the spotlight that came with being a part of the nobility. However, he was always on his best behavior and seemed to have a sense of grace about him as he grew older. He won the hearts of many, his gentleness and bright spirit attracting the attention of women both young and old. He would go out of his way to help anyone in need despite his father's disapproval, gaining the favor from many within the city. For a long time, Fëanor had known that A'liara wasn't his real mother, and had hoped to one day find the one who had given birth to him. Fate was against such a reunion when one day a small parcel for him arrived at the Balmiren estate. With A'liara quickly taking him away from one of her husband's meetings, the woman presented the parcel to the now seventeen-year-old. With A'liara already knowing what was inside and where the package came from, she watched in pained emotion as the boy she had raised as her own revealed the contents within. There was a holodisk as well as a necklace. Quick to see what was on the holodisk, Fëanor was soon face-to-face with the image of his mother. The joy he had in seeing her for the first time quickly departed. The Sephi woman he saw revealed that his receiving of the message meant she had died, and that she always wanted him to know that she had loved him. The grief was too much to bear, and he soon found A'liara's arms around him as she did her best to comfort him. Calcos' sudden entrance into her study would quickly be met by a rage-filled Fëanor who struck him with a stream of Force lightning before landing a flurry of punches. The noble surely would've been beaten to death were it not for his wife's interference. Though he wanted so badly to kill the man responsible for his mother's suffering as well as his, he backed down out of respect to A'liara and himself. The decision was then made that he would leave, and he bid his adopted mother farewell before leaving behind his home forever. With home no longer home to him, and his heart broken from the loss of his mother, Fëanor had nowhere else to go except wherever the Force led him. Before he had left the estate, he had broken into his father's private collection of artifacts and weapons, taking a few to sell for money. Ony of those weapons was a double-bladed lightsaber, to which he would form a connection with and decide to keep. He would spend hours everyday training with it, remembering the many combat lessons he had with one of his father's brutal guards while remembering the few discussions Lillian and he had regarding the use of a lightsaber. For a while, Fëanor would take up jobs to help support himself, and eventually came into the employment of a mercenary group that worked closely with law enforcement on various worlds. The experienced provided him a chance to hone his skills with the Force and lightsaber to where he was proficient in both. It would be years later at the age of twenty-five when he would find himself in the Caperion system face-to-face with an assassin of the Imperial Clan of Scholae Palatinae. The young man would also come to disown the Balmiren last name, and gave it up for his mother's family name instead, and would go from being Fëanor Láng Balmiren to just Fëanor Láng. Fëanor is a quiet and reserved individual who has a tender heart and spirit. He's willing to help out anyone in need and will defend anyone he truly cares about. He loves the pursuit of knowledge and experience and spends many hours meditating in the Force to learn more as well as find some peace when hard times hit. His trust is hard to earn, but certain individuals may be lucky and find within him a good friend they can count on. He's also not afraid to be blunt. Especially if it's for the sake of helping anyone he cares for. For those he is close with, he tends to show his gentle and slightly humorous side, especially if he's trying to cheer someone up. He has a love for children and animals alike and has the utmost respect for the elderly and those with power so long as they earn it. If ever angered, the last thing anyone wants to do is get in his way. Though he's focused and can carry out such anger with grace, his wrath can be a storm that knows no bounds depending on the severity of the offense. His emotions can be reflected in the appearance and strength of his Force lightning ability. Fëanor finds himself more dark side leaning ever since the day he nearly killed his father. He isn't afraid to use emotion to do what is necessary and draws upon the dark side frequently when using the Force. The kindness and compassion that still resides in his heart keep him from falling completely, and he uses his growing power for the good of others. To him, fearing power only holds you back away from your potential, but as always, with great power comes great responsibility. He never allows the dark side to command him. His fate is his own, but he still seeks guidance through the Force to seek out his purpose. Fëanor is a tall adult at 6'1" with a pale complexion and lean build. He did not inherit his mother's Sephi traits, but did inherit her purple, almond-shaped eyes with everything else being from his father. He has long, black hair that goes to his mid-back, though now and then he allows it to grow longer. There is purple in his bangs as well as some highlights. 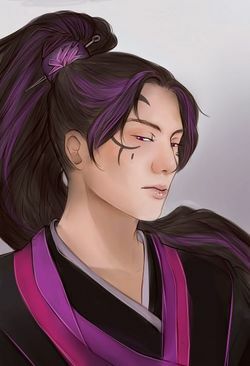 He tends to wear dark clothing, mostly those with some purple in them in honor of the Láng family colors. He also sports black tattoos on his face as a symbol oh his freedom from his father. One noticeable thing he tends to wear or hang onto is his mother's necklace. With a silk ribbon serving as a chord, a lotus flower made from amethyst and yellow yellow diamond laid upon a silver-lined, rhombus hangs from it. Being the only thing he has of his mother's, it's the most precious thing he has that he always keeps on him. When not busy assisting the House, Fëanor tends to relax and take time to continue his studies in the Force as well as enjoy peaceful walks in nature. Going out and reading a nice book or meditating beneath a tree with a cup of tea is usual for him. Walking through the city streets of Caelestis City and visiting the market is something else he likes to do. He's always open to learning new cultures and customs and takes pride in learning the arts from other cultures as well. Now and then, he may take a stab at writing poetry himself or making a simple painting. Now and then, he'll go looking for and capture fireflies like he used to do with A'liara when he was a boy. Fëanor Láng is currently a Force Disciple with affiliation to Clan Scholae Palatinae, House Imperium. Once the son belonging to a surviving, noble Alderaani family; Fëanor now works alongside members of the House when needed by its Quaestor, Shadow Nighthunter. A Dark Jedi who delves in Force sorcery, the half-Sephi continues to seek his purpose in life as well as serve and assist Shadow in any way possible. This page was last modified on 10 April 2019, at 00:11.